A delegation from Sony Music Entertainment Africa paid a visit to the head office of Copyright Society of Nigeria (COSON) early this week. The delegation led by the Managing Director, Mr. Sean Watson met with the Chairman of COSON, Chief Tony Okoroji and the society’s General Manager, Mr. Chinedu Chukwuji to discuss ways in which both organizations can work together for mutual benefits. During the meeting, the landscape for the licensing of musical works and sound recordings in Nigeria was discussed. Also addressed were digital music exploitation and the best ways that both organizations can work together to harness the potentials of the digital age in music licensing and distribution. “At COSON, our mantra is ‘Let the music pay’ and this mantra provides the energy that drives everyone at COSON to do everything we can 24 hours every day to ensure that music is profitable for all those who invest their talent, ingenuity and financial resources to create and make available the music that the world enjoys. By now, I believe that everyone in Nigeria knows that our commitment to making the music pay for all music stakeholders and our country is total. “We are not apologetic for the energy and passion we dedicate to this cause because our success will result in more wealth for our nation and more jobs for the large number of unemployed young people in our country.”COSON is today the number one institution driving the Nigerian music industry. That is a result of the unparalleled knowledge, experience and worldview behind the COSON leadership. With our hyperactivity, we continue to move closer to our objective of being the number one copyright collective management organization in the African continent. It is no longer debatable that Nigeria is today the hotbed of popular music in Africa. We will not allow the Nigerian nation fritter away such historic opportunity. “We are determined to make Nigeria the most attractive place in the continent for investment in the entertainment industry, a place where the laws and commitments are respected by all. Today,COSON is represented in more than 85 countries around the world. As we seek respect for the music of Nigerians used in other countries, we assure you of the protection in Nigeria of the rights of the owners of all music, local or foreign, used in Nigeria. We are very happy with your desire to collaborate with us to let the music pay for everyone around the world in Nigeria.”Commenting on the visit, the General Manager, Mr.Chukwuji said, “We are glad to have Mr. Watson and his team from Sony Music Entertainment Africa here in our office and we look forward to a great working relationship with them.COSON is open to partnerships such as this which will be beneficial to the society and the creative industry in Nigeria. 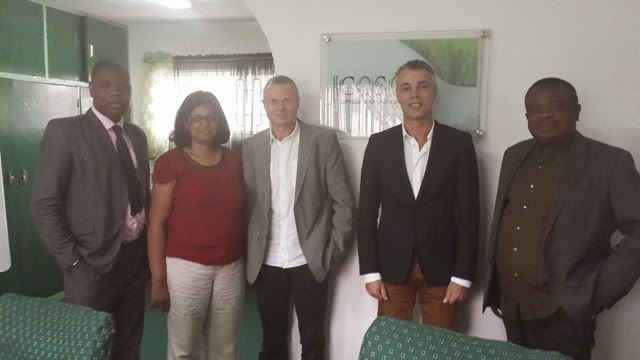 COSON is all for innovation and great opportunities that can move the Nigerian music industry to greater heights”.Accompanying Mr. Watson from the South Africa based organization was Ms. Manusha Sarawan, Director, New Business/Legal& Business Affairs and Mr. Craig Brown, Director of Finance. Sony Music Entertainment is home to international artistes like the late King of Pop, Michael Jackson, Justin Timberlake, Celine Dion, Shakira, John Legend, Pitbull, Rita Ora, Avril Lavigne, Beyonce amongst others.